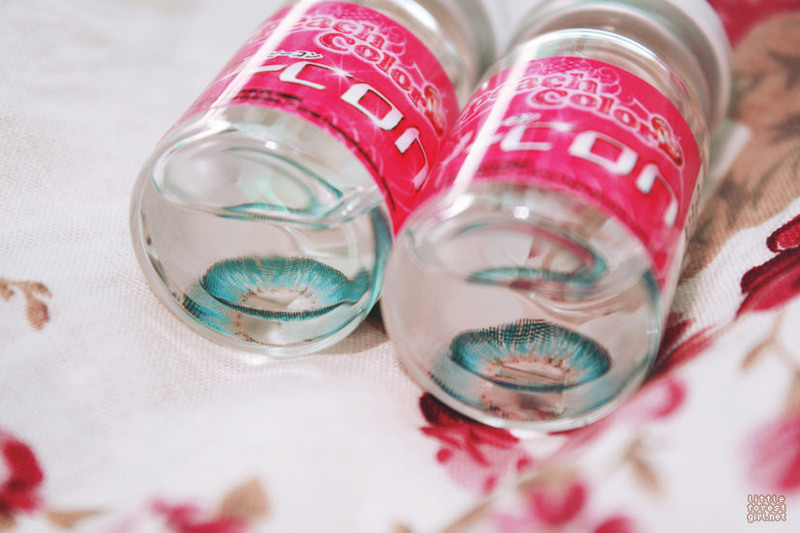 Believe it or not, these lenses were actually sent to me 5 months ago ;; I'm so sorry! It's not like I forgot about them, but it took me quite a while before I could come up with eyemake that would look good with it. This doesn't mean that only a certain look goes with it, it's just that I'm very particular about these things, especially since the focus would be my eyes. If it doesn't look nice I delete the photo right away. This certainly took me a while, but here it is! I don't know why, but the bottle says Peach Color. I'm pretty sure these are EOS though. The lenses, in the lens case. The blue is super vivid! I don't know if you recall, but a few months ago I reviewed its less-striking sibling, the Puffy 3 Tone Grey. I liked it so much that I decided to try out another color. 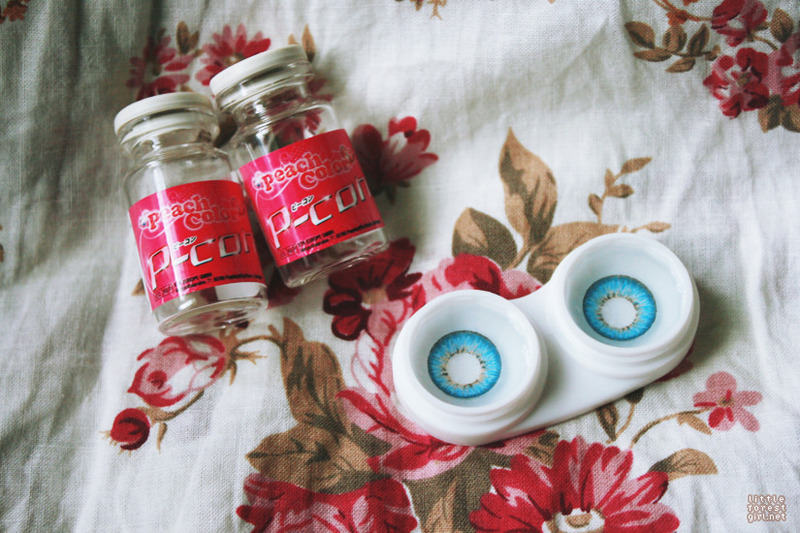 Usually I'd go for more natural color lenses such as brown or grey, but nothing as striking as blue. Violet or pink would be okay too. So why did I choose blue? I just thought I'd give it a try, lol. In natural light. Even with the super-vivid blue color, they don't look weird at all! With (a lot of) flash. These photos remind me of Zipper models Yura and Amo~ They wear bright blue lenses as well. As expected of this series, the color and design is just amazing. What I really like about these is that even if the color is so vivid it still looks natural somehow. Like I was born with blue eyes, haha! This is because the design of this line doesn't have the thick black outer ring that most contact lenses have, so it blends really well into the eyes. Also, for a light-colored lens the color is pretty apparent even against dark brown eyes. Pretty photogenic too! You can use these for cosplay as well. Not very enlarging at 14.5mm, unfortunately. But like I said before, I think 14.5 is the perfect size for this series' design. Any bigger and it would look weird, since the line seems to be designed to look very natural. Though the comfort is okay, these tend to become dry after a few hours. Around 5 for me on normal days, and 2-3 on hot days. It's a pain to wear sometimes too, when wearing falsies. 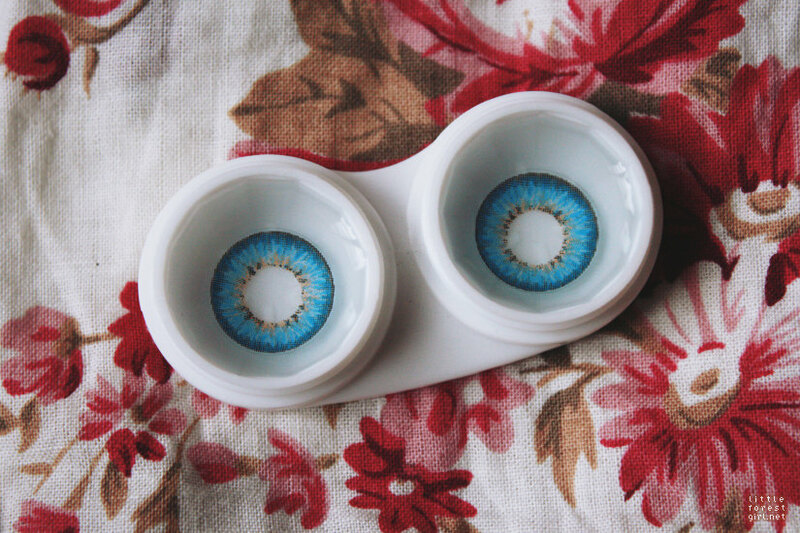 One time I was wearing these with falsies, and it was super hot outside, my eyes suddenly just started tearing up. Luckily I always wear waterproof makeup, but you know. Four out of five stars. As much as I really like these lenses, the comfort issue is a problem. It's sad that I can't wear them as much as other lenses. Really pretty though! Might just wear these for photoshoots and such.